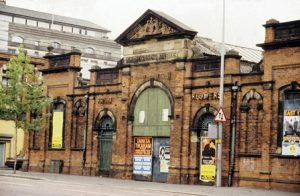 St George’s Market was built in 1869 to the designs of J C Bretland and has always been a prominent Belfast landmark. 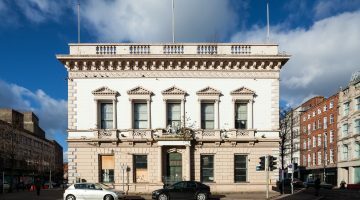 Despite this, the building struggled to survive with increasing maintenance costs; changes in hygiene regulations and its ‘once a week usage’ – leading Belfast City Council to consider plans to redevelop the site 1993. Luckily the traders and local community recognised the significance of the market, historically and within the local community and campaigned to ’Save St George’s Market’ ensuring its present day survival. 1997–1999 the multi–million pound project was implemented by the Council (carried out by architects Consarc Design) and partnered with Laganside Corporation and the Heritage Lottery Fund. The project involved specialist repair work to the cast iron gates, stone and brickwork. Internally the building is now a light and airy open space now capable of holding events as well as the thriving market. 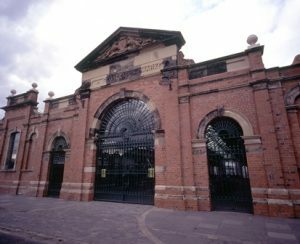 The iconic building has now been reinstated to its previous elegant, yet practical Victorian character and serves as not only as a popular indoor market, but visitor attraction– being voted one of the top 5 UK markets in 2006 by the National Association of British Market Authorities. £3.5m refurbishment funded under: NIEA Listed Building Grant Aid; Laganside Corporation; Heritage Lottery Fund and Belfast City Council.